Hand knitting involves drawing new loops through old. So first, you have to HAVE some loops. Putting the first row of loops on your needle is called "cast on" or "casting on," abbreviated "CO."
In many kinds of casting on, you first make a floppy sort of foundation row, often a row of simple loops which happily share yarn with their neighbors: growing or shrinking with the merest tug. To start your knitting, you must chase these skittering loops around the needle. 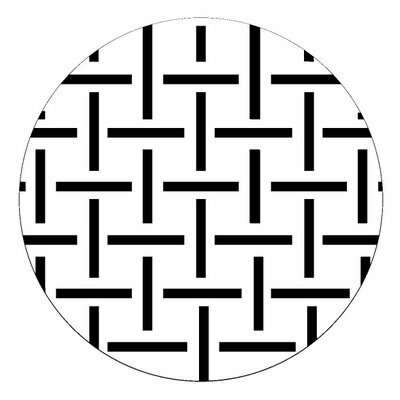 It isn't until the third or fourth row that you get a rhythm going, and the foundation row often looks lumpy and distorted. With long tail cast on, you don't have these problems because you make the foundation row AND knit the first row at the same time--that's why it's my favorite. 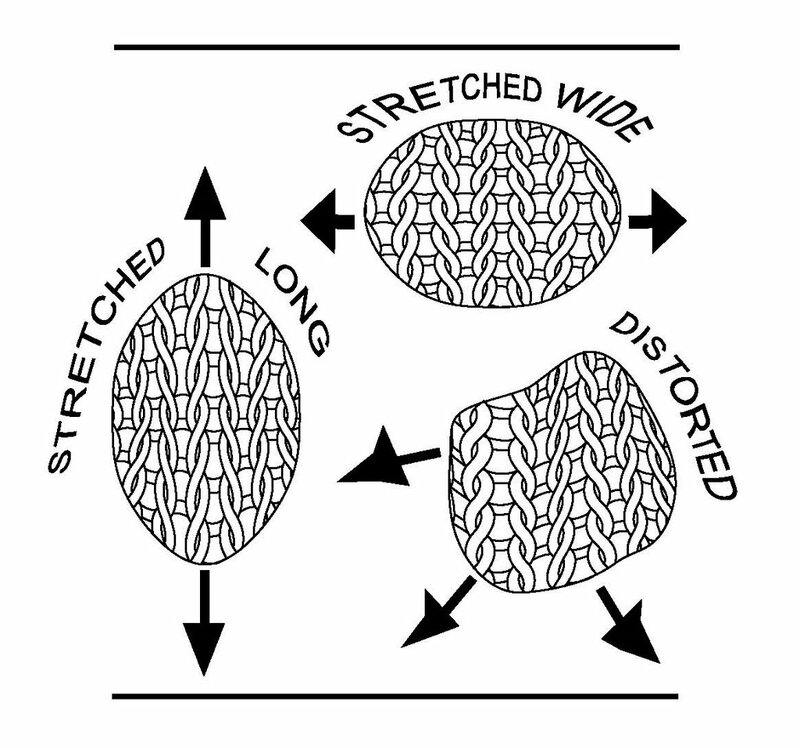 In other words, long tail casting-on produces a uniform row of loops already pre-knit into the underlying foundation row. 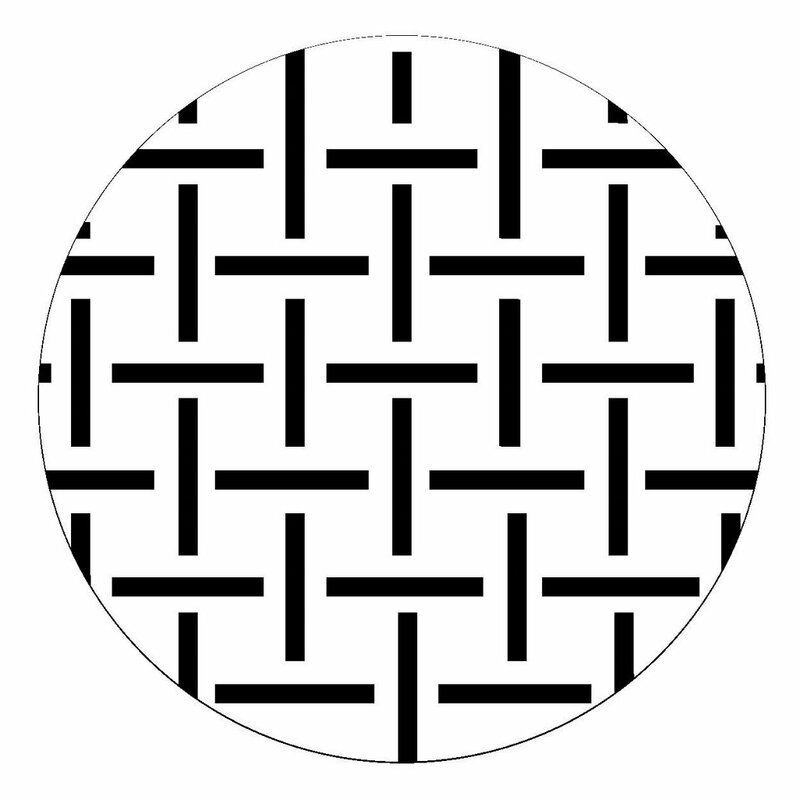 These loops and the foundation row stabilize one another. Another advantage: for circular projects, other kinds of foundations are a bit skimpy; they're hard to hold right-side up so as to avoid making the dreaded moebius strip. In long tail cast on, you've actually created a looped foundation row AND a first row of knitting at the same time. Because more fabric lies on your needles, it's easier to keep the whole works sunny-side-up when you join for a circular project. A note to the unconvinced: if you've tried long tail casting on and gotten a tight, unyielding edge, you're not alone. But it's such a great method, I urge you to try again. 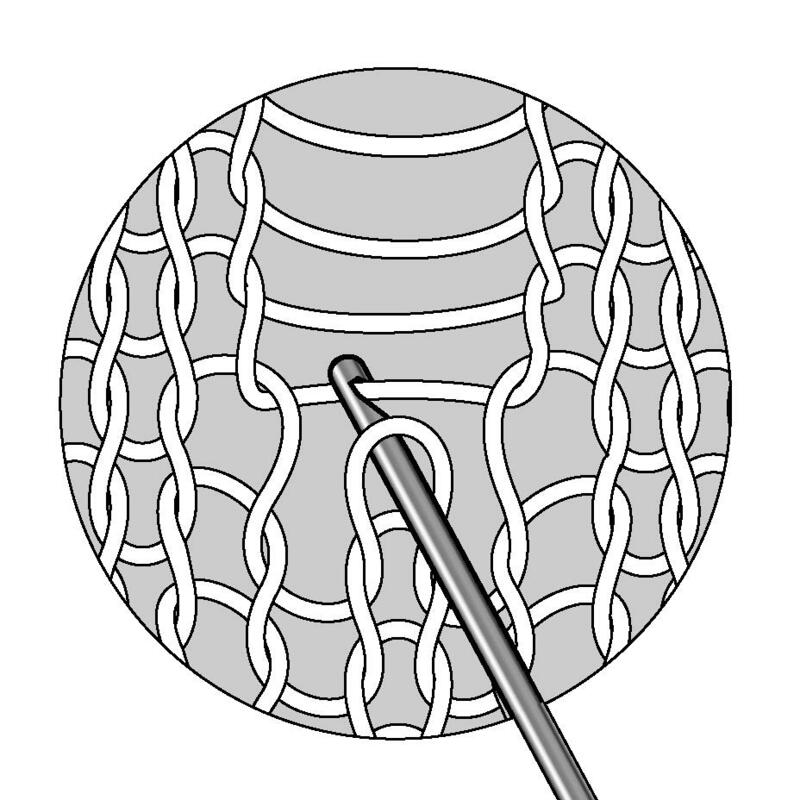 In most knitting directions, the first stitch is shown as a slip knot. I think they're second-rate, and at the very end of this post I show a better way. 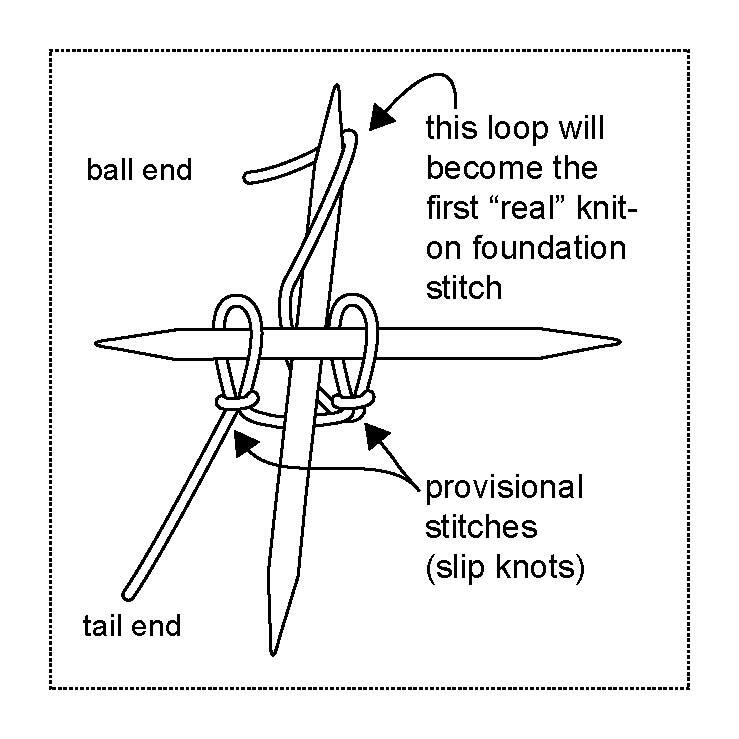 But because most knitting instructions call for a slip knot, you might as well know how to make one. 2) catch the tail end through the original loop and pull on the top of the new loop you just made. 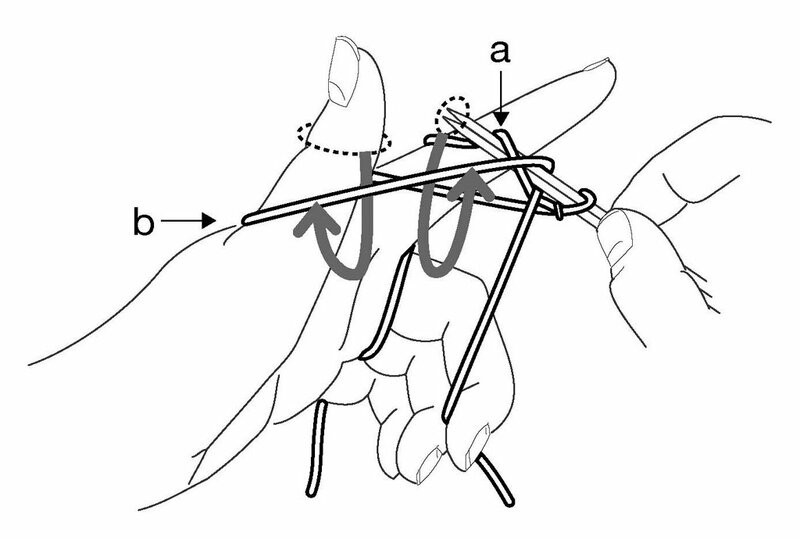 4) snug the new loop around the two needles by further tugging on the tail end. 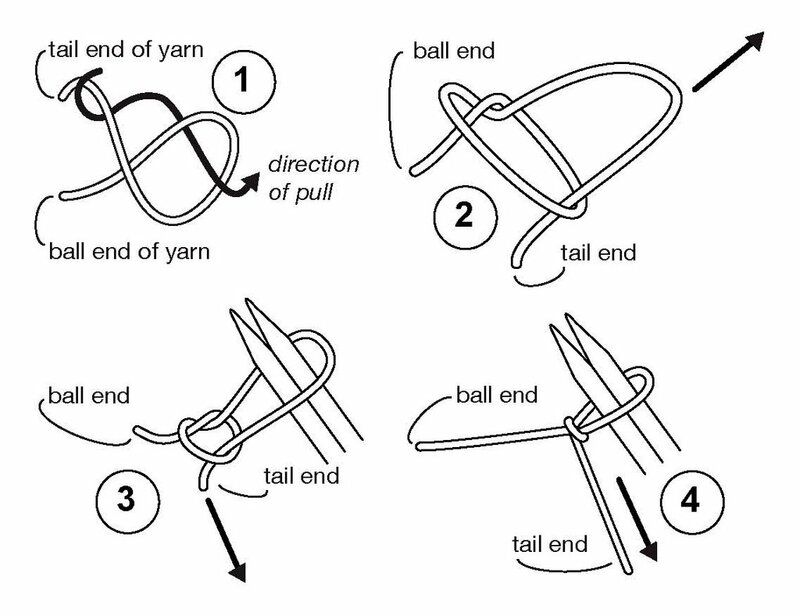 BTW: Here is a short cut to making a slip knot: Make a pretzel shape as shown below. Insert the needle as shown: over, under, over. Once the needle is through, hold onto both ends of the yarn and pull up with the needle. Then, tighten by pulling on the tail end. Voila: instant slip knot. or: why is my tail always too short? 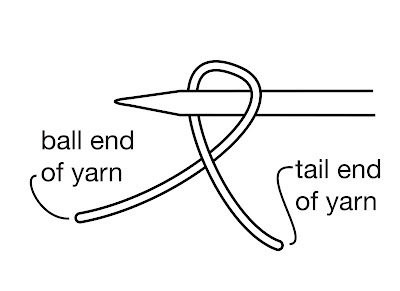 A lot of knitters DESPISE long tail casting on because the tail always winds up a few stitches too short. And there truly is no cure if your tail is too short the first time you try to cast on-- you'll just have to pull it out and do it again. But there IS a cure for moving the knot again and again, having the tail come out too short a couple of more times, and then suddenly, infuriatingly, having the tail coming out WAY too long. See, with long tail casting on, you're making a looped foundation row at the bottom, and putting a first row of knitting on your needles, both at the same time. The top loops are a lot bigger than the bottom loops and take up a lot more yarn. 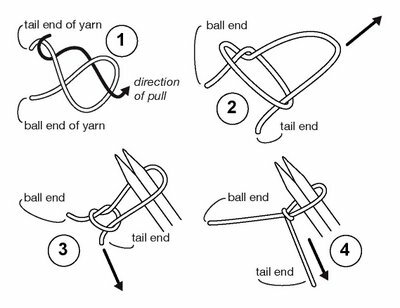 So, what makes sense is to use the ball end of the yarn to create the bigger top loops, and the more limited tail end to make the smaller bottom loops. My casting on instructions are very specific about which is the ball end of the yarn, and which is the tail end. If you consistently arrange the yarn this way, then at least when you move your first slip knot to a new spot and try again, you've got a far greater chance of getting it right. And, if you always arrange your yarn the same way, experience will shortly teach you how much to pull out in the first place. Thread the yarn on your left hand as shown. The ball end (the end going to the ball of yarn) is to the left, trailing from your little finger, and the tail end trails from your thumb. The slip knot you just made is partway along the tail end. The yarn passes twice through your fingers. You tension the yarn by pressing together the little finger and the ring finger, as well as the pointer finger and the middle finger. 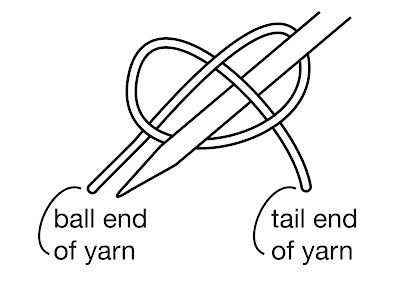 The strand marked "a" is the ball end of the yarn; "b,"the tail end of the yarn. 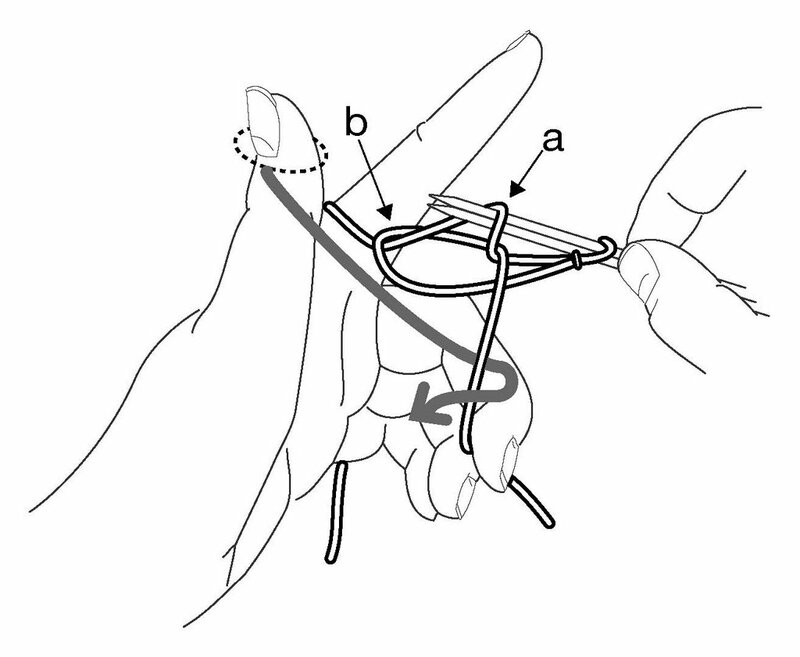 Holding the needles with the slip knot in your right hand, arrange the yarn on your left hand as shown: the ball end remains between your ring and little fingers. Catch the tail end between your middle and fourth finger. Insert your thumb into part "b" --that is, the loop of yarn which stretches between the needles and your middle/fourth fingers. 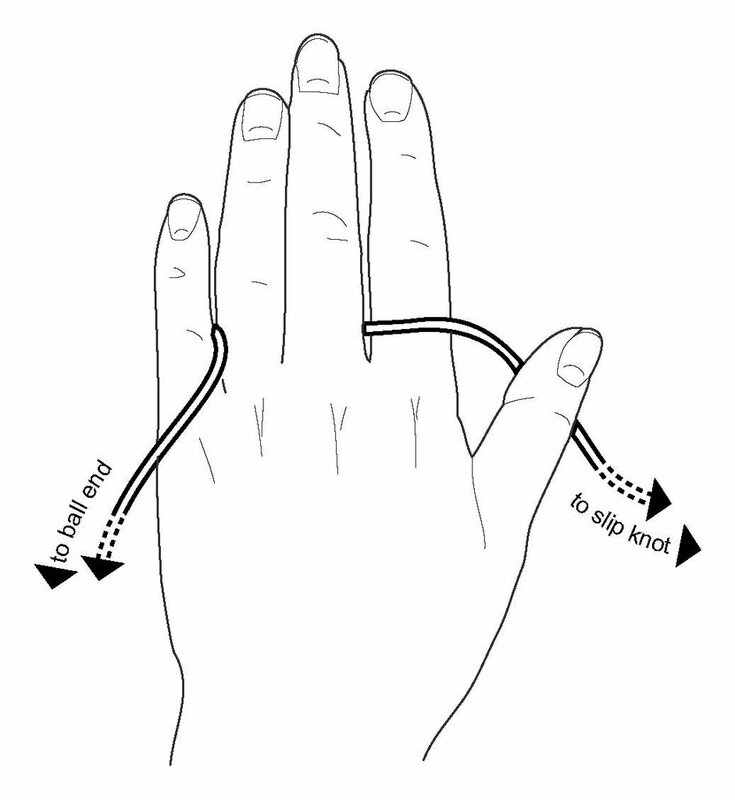 To get to the third step, swing your thumb towards you and up, as shown by the gray arrow. 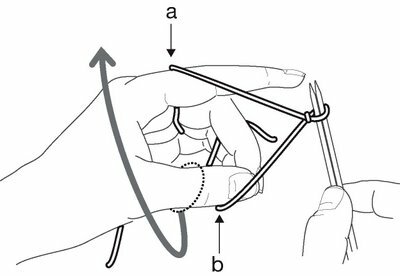 Once you've swung your thumb towards you and up as instructed in the second step, your hand should look like the picture below. To get to the fourth step, swing your right hand down, as shown by the arrow. Your ring finger has a lot to do. The base of your ring finger is pressing against the base of your little finger to hold the ball end of the yarn in tension. 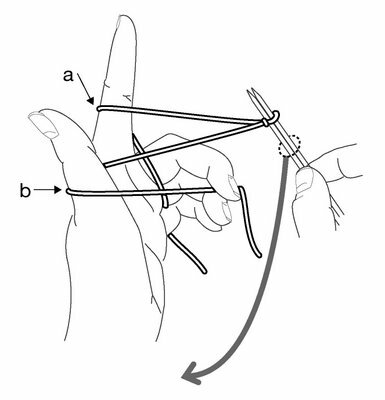 The top of your ring finger is pressing against your middle finger to hold the tail end of the yarn in tension. 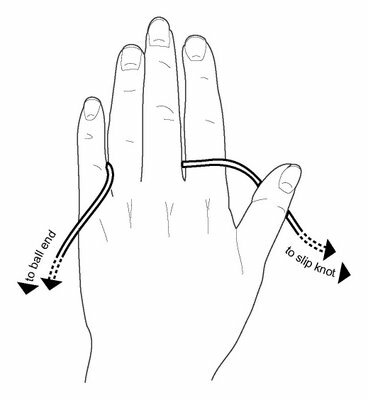 Once you've swung your right hand down, as instructed in the third step, your hand should be positioned as in the picture below. 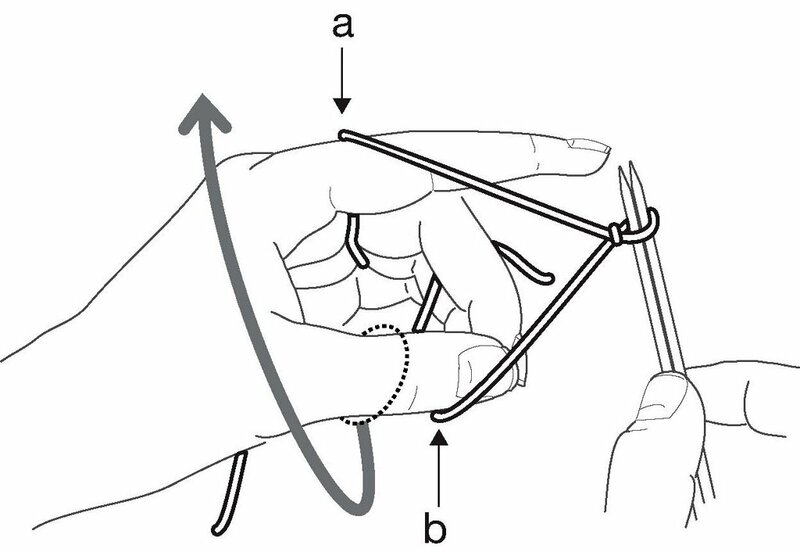 To get to the next step, follow the gray arrow: insert the tip of the needles through loop "b" on your thumb, and hook them around the front part of loop "a." 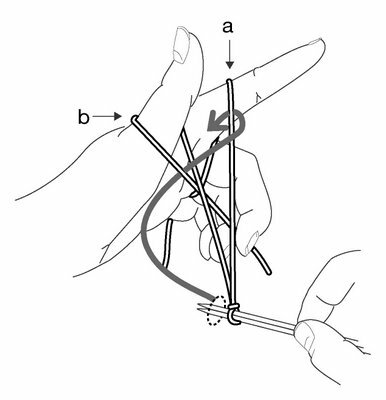 After hooking the front part of loop "a" with your needle as instructed in the fourth step, your set-up should look like the picture below. 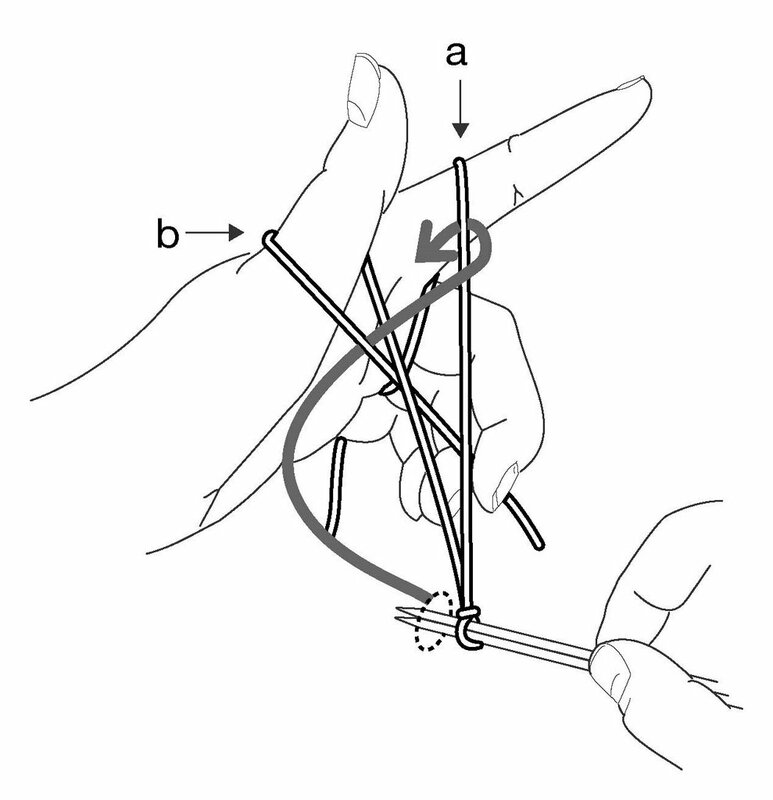 To get to the sixth (and last) step, swing the needles down and towards you, bringing loop "a" through loop "b." At the same time, swing your thumb down and out of loop "b." After you've removed the needles and your thumb from loop "b," loop "b" is left wrapped around loop "a." In other words, what you've done is draw loop "a" through loop "b." Loop "a" is a stitch in the first row of knitting, and loop "b" is the foundation row through which that loop passes. Long tail casting on is the same thing as making a foundation row of backwards loops and then knitting your first row into those loops. But making the foundation row and the first row at the same time is far easier than making the foundation row first, then trying to knit the first row into loops which skitter maddeningly around your needle. 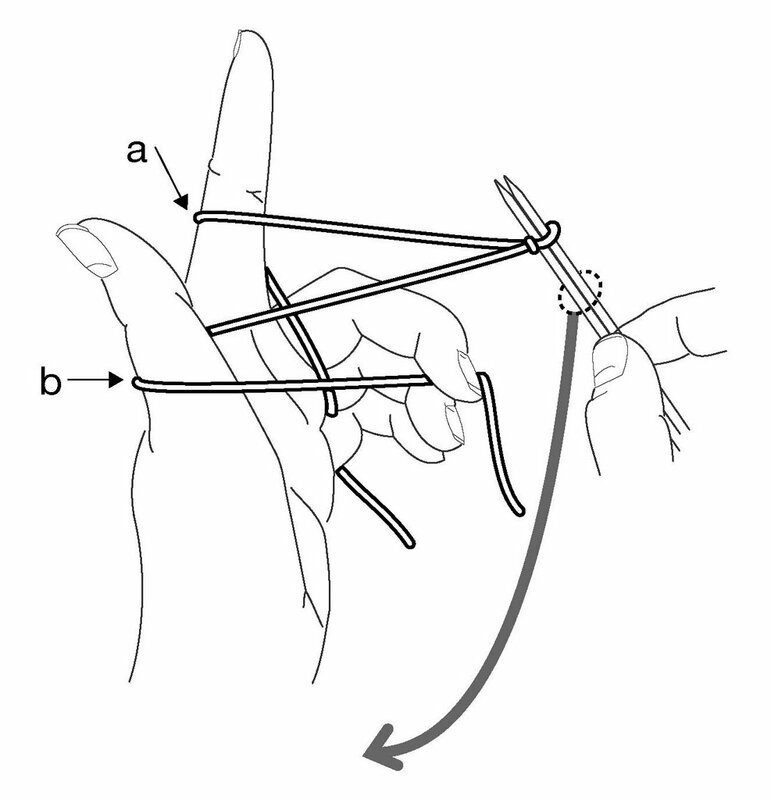 If you follow the gray arrow and pass your thumb around the yarn below the newly cast-on stitch, you'll see that your hand is in the same position as step 3, above. From here out, repeat steps 3 through 7 over and over again until you have the correct number of stitches on your needles. One last, but VERY IMPORTANT thing: When you complete the cycle of stitch creation and swing your thumb into loop "b" to make all look as it does in step 3, you are tightening up the bottom loop of the previous stitch. It is NOT necessary to yank that loop as tight as possible as you swing your thumb up. Rather, it is best to be mild in this adjustment. A tight and constrained long-tail cast on is directly traceable to an over-tightening of the bottom loop in this last step. Here are some notes to the wise, so you don't make the same stupid mistakes I do, over and over again. 1) Count your stitches. I often count the stitches as I cast on, only to find (five rows later) that I've got one stitch too many because I forgot to count the first stitch, which was made differently. 2) If you're making a pattern which requires you to count rows religiously, try to figure out whether pattern author cast on long-tail or some other way. Long tail casting on creates a first row as you cast on. Your first pattern repeat might have one too many rows if you don't count long-tail casting on as the first row. For further information about how to count rows in knitting, click here. 3) If you've pulled your second needle out, and then discover that you have too few stitches cast on, no worries. If you still have enough tail yarn left, simply hold the second needle next to the first and cast on some more stitches, then pull the second needle out of the newly added stitches: no need to unravel all the way to the beginning. The point of this blog is to infest your mind with all the little improving viruses which currently infest mine. So here's the best way, in my mind, to make the first stitch in your knitting. (FYI: this also works for the first stitch in crocheting.) If you make a simple loop, there's no knot. To start your knitting with a simple loop, just insert your needles and twist, and there's the first stitch, waiting on your needles. If the loop unwinds when you make the second stitch, that only means that you made the loop with the wrong end up. Twist it the other way and try again. 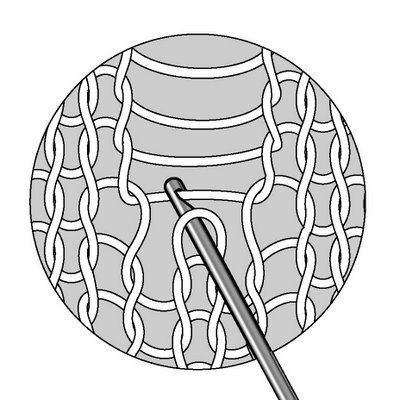 Final tangential thought: Although slip knots are not a great way to start your knitting, they have many other uses (such as making provisional stitches intended to be unraveled.) But, slip knot's highest and best use is tying balloons onto children and vice versa. If you practice this skill you'll be the hit of the next birthday party as the "balloon mommy." ADDENDUM: If you have a truly monumental number of stitches to cast on, and want to do it using the long tail method, click HERE to be taken to a different TECHknitting post about a nifty little trick which assures that you CANNOT run out of yarn. 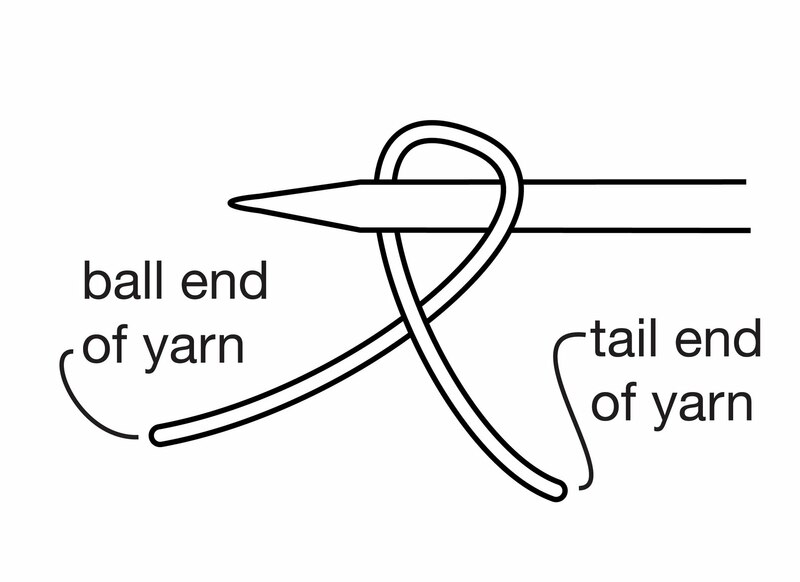 You have been reading TECHknitting on "long tail cast on." Seems like a logical place to start: What IS knitting? How is it constructed? How does knitted fabric differ from cloth? And what's so special about knitted fabric, anyhow? Knitting is made of a continuous yarn formed into loops, which are drawn through other loops. Each stitch maintains a connection with all the other stitches in its row and in its column, even after the knitting process is complete. 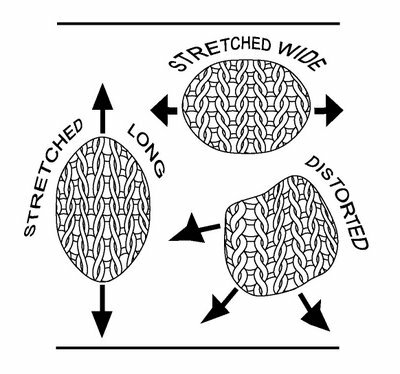 By contrast, woven fabric is made of cut lengths of thread, which have no connection (other than proximity) to their surrounding threads. Because of knitting's unique structure, it S-T-R-E-T-C-H-E-S. Each stitch traces a loopy path through the fabric, so the yarn lies coiled within the fabric. There is plenty of "reserve" yarn to stretch. Unlike the threads of woven cloth (which trace a straight line through woven fabric) knitting can be stretched wide, or long, or even distorted both ways at the same time. Knitting's outstanding capacity to stretch means that everyone today wears knits, even people who think they "hate knitting," because knitting isn't just the sweaters created by hand knitters. T-shirts, sweatshirts, underpants, socks are all knitted of very fine yarn on giant machines. When you consider that they had to wear woven fabric against the skin, it's no wonder folks look so crabby in those old-time photos. Being able to rip out may not seem like much of an advantage, but it is: if you make a mistake, there is nothing to throw out--the yarn can be re-used (very different than the cut threads of weaving). Also, it is possible to snip a stitch and ravel out a few stitches along a row of already-knitted fabric. 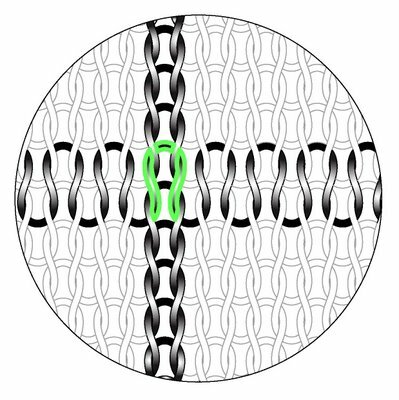 Snip and pull, and you get a horizontal opening surrounded by the loops of the rows above and below. Put these newly-exposed loops back on a needle, and you can knit in a whole new piece of fabric. This is the secret of after-thought buttonholes, after-thought heels, after-thought pockets, after-thought mitten thumbs. If you ravel across a whole row, or around a complete round, the knitted fabric splits in two. The loops of either half can be put back on a needle knitted up (or down). 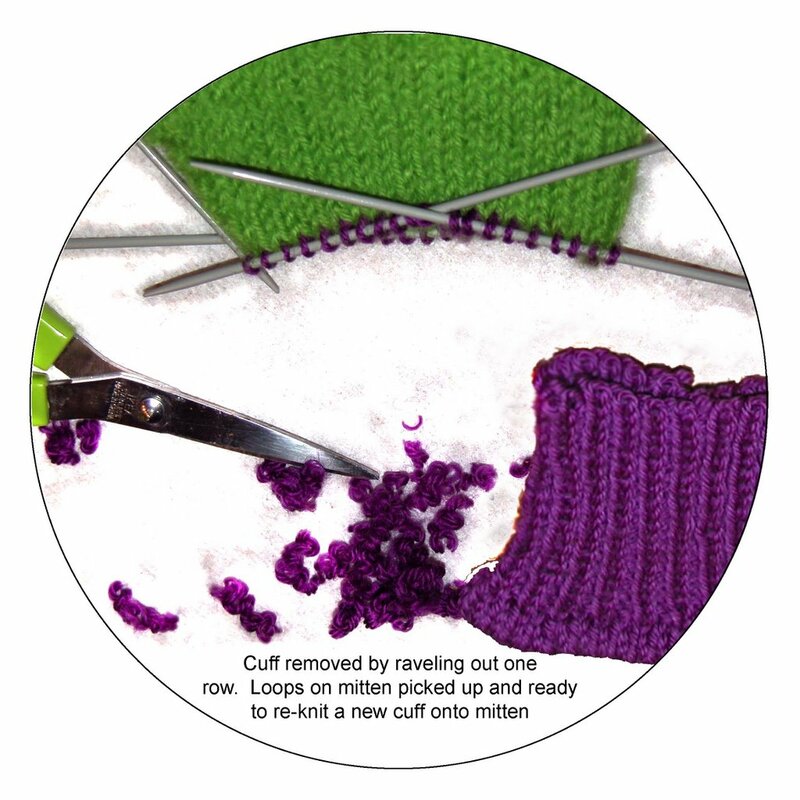 This is the way to lengthen already-knit sleeves without pulling them out, or take a worn-out cuff off a mitten and add a new one, as in the picture below. A third advantage of knitting's row-and-column structure is that knitting can "run out" in the columns. Once you've seen a run in a nylon stocking or a T shirt, or the laddered mess above a dropped stitch, you may not think of this as much of an advantage, but it is. Drop a stitch down on purpose and you can correct a mistake 20 rows back without ripping back, row by row. Once the mistake is fixed, you can hook the run back up with a crochet hook, ladder by ladder, to the top. For further information about correcting errors, use the series index in the sidebar to find posts on "correcting errors in the row below." As to how knitting is created, there are two methods, needle knitting and peg knitting. Hand knitters do needle knitting: as you transfer the loops on the left needle to the right needle, you draw a new loop through each old loop with the tip of the right needle. 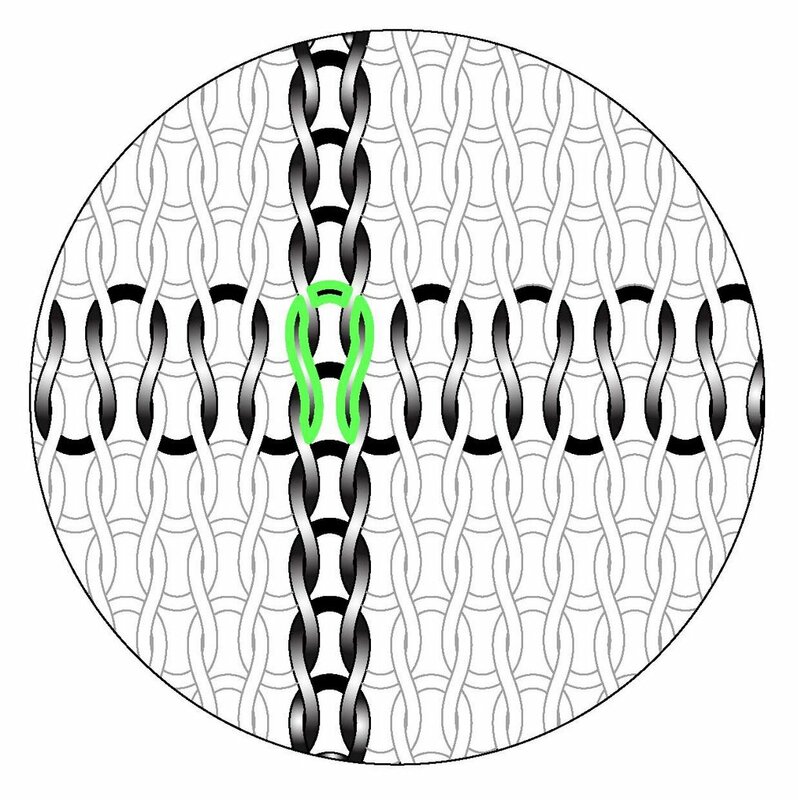 This continuous web of loops makes knitted fabric. The most familiar example of peg knitting is spool knitting. Knitting "looms" (which are nothing but much bigger spool knitting frames) are currently a sort of mini-fad at craft and fabric shops. Knitting machines are also peg-knitting devices. On all peg-knitting devices, a separate peg holds each stitch, the yarn is wound around the outside of the peg, and the old loop lifted over the new loop with a "pick" or hook, either manually (spool or loom) or mechanically (knitting machine). Both needle- and peg-knitting produce the same fabric: loopy, stretchy knitting. And now, goodnight. My husband is ready to kill me because all these illustrations (not to mention the HTML code) take for-freaking-ever. So, after 25 years of knitting, various knitting tricks have manifested themselves to me. And, after 25 years of knitting, these tricks, like a virus, are desperate to get out and infect other knitters. Beware. Once you discover there is a trick for every part of your knitting, you'll never again be happy with ruffled cast-on edges, or too-tight cast-off edges--with puckery points and floppy felting. There is a trick for going back a couple of rows back in lace knitting (before you made that terrible mistake) without tinking every stitch, there is a trick for lengthening the too short-sleeves without ripping out and starting over; there are hundreds and hundreds of tricks, and over time, they'll appear in this blog. Along these lines, I hope that if you have a trick infesting your mind, you will share it in the comments section. So, give me a chance to get my feet wet in this new medium, and pretty soon the tips and tricks will be flowing along. We'll talk again soon.